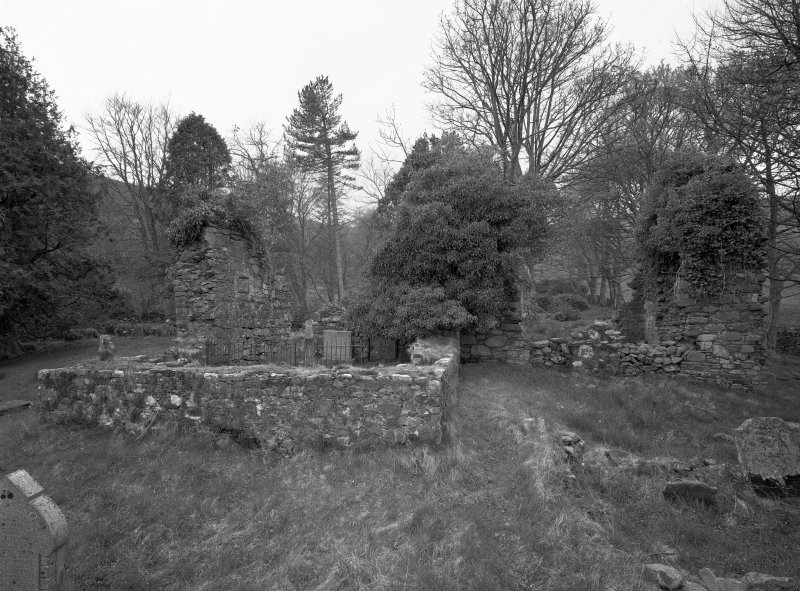 Argyll, Saddell Abbey. 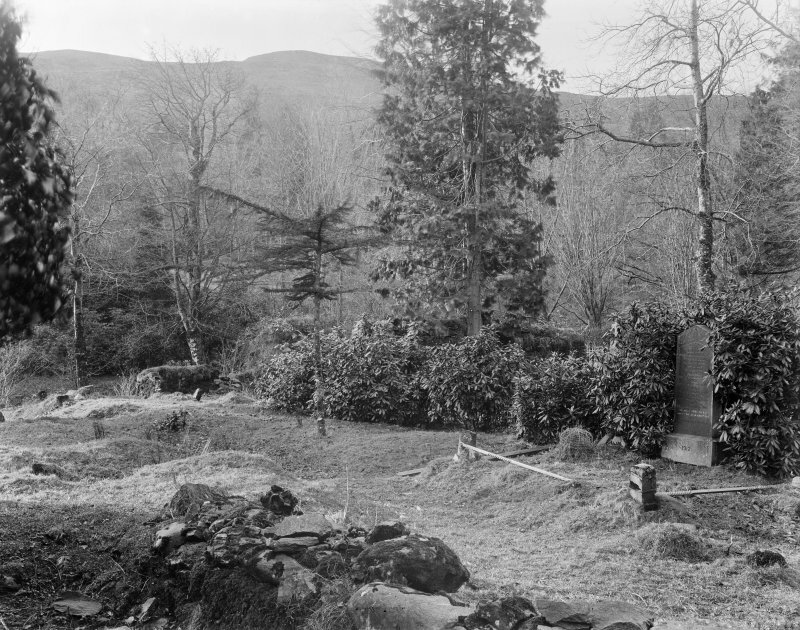 Burialground, Campbell of Glen Carradele. 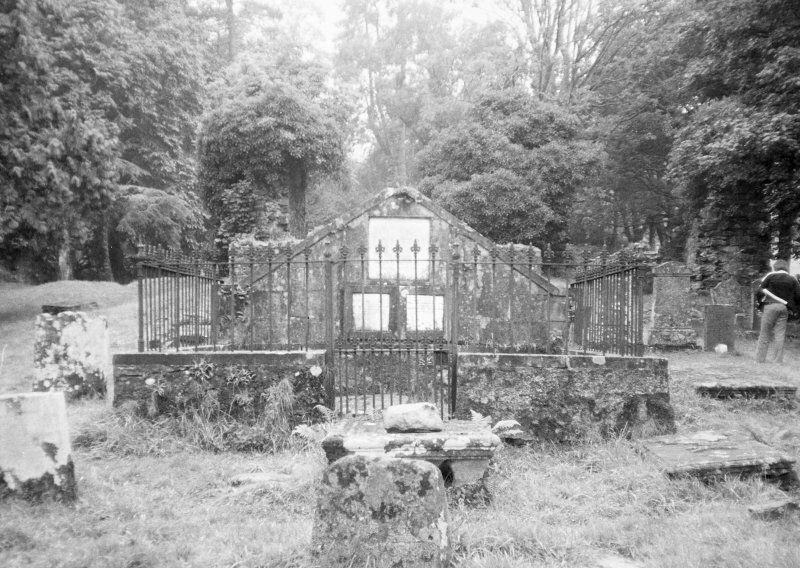 Burial enclosure. 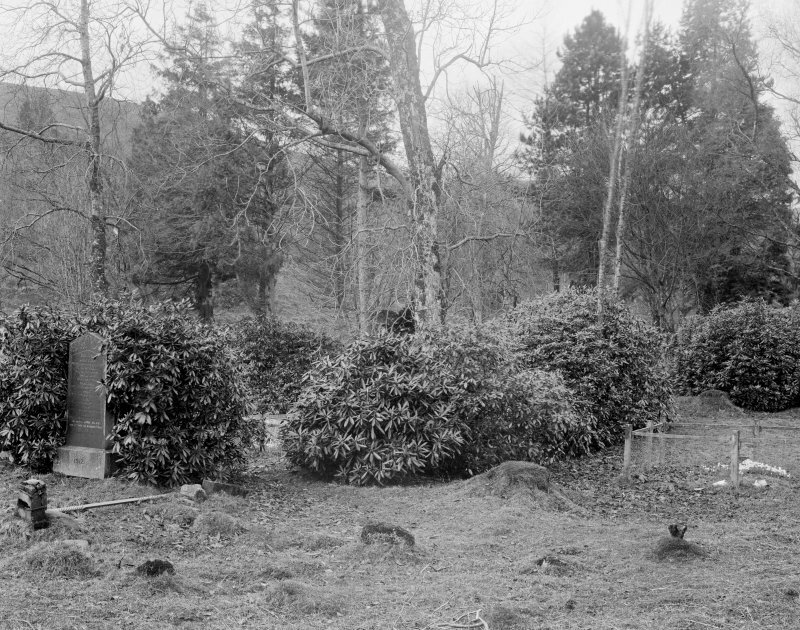 Argyll, Saddell Abbey. View of crossing from East. View of Early Christian monument. View of remains of abbey. 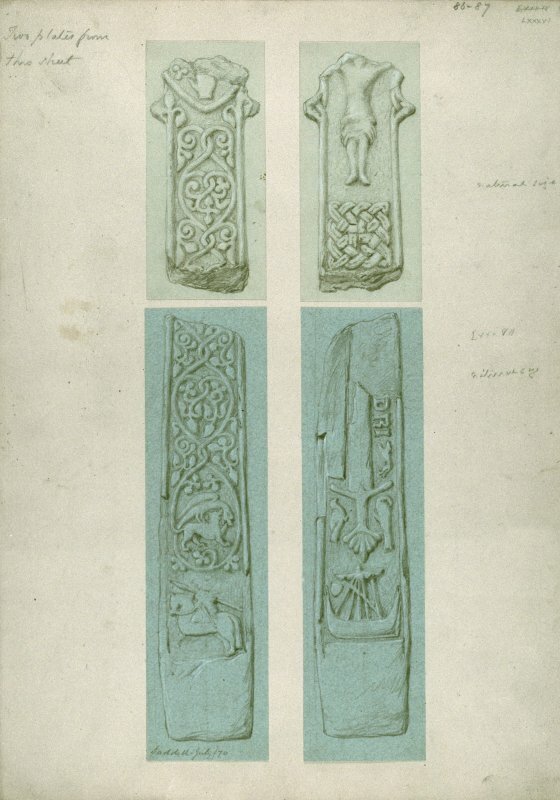 Original drawings for plates LXXXVI and LXXXVII of Sculptured Monuments of Iona and the West Highlands by James Drummond. The reverse of a fragment of a sculptured cross (as on plate LXXXV). Obverse of above (as on plate LXXXV). Lower part of shaft of a sculptured cross, bearing an armoured man on horseback and foliaceous scrolls coming from the tails of two animals. Insc: 'Saddell July/70.' Reverse of above, bearing a galley, a sword, two birds and the remains of a defaced inscription. 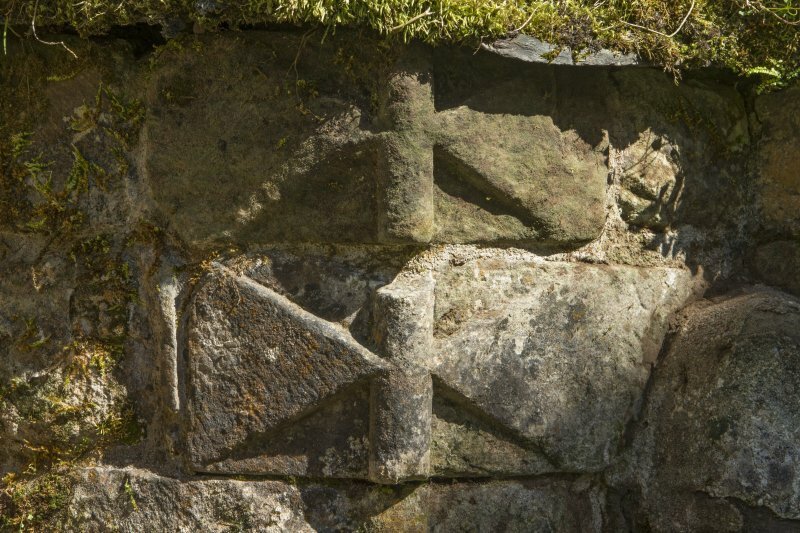 Argyll, Saddell Abbey. Photographic copy of site plan. 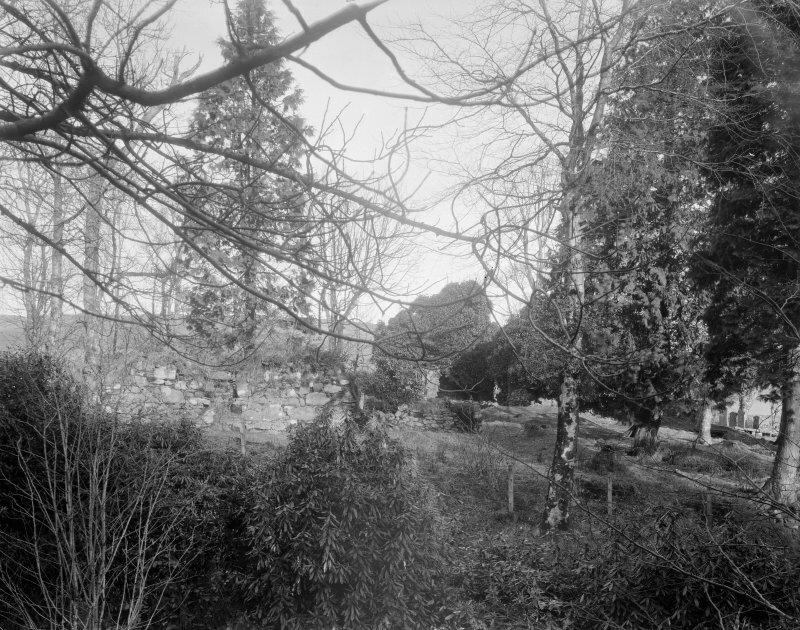 Distant view of remains of abbey. 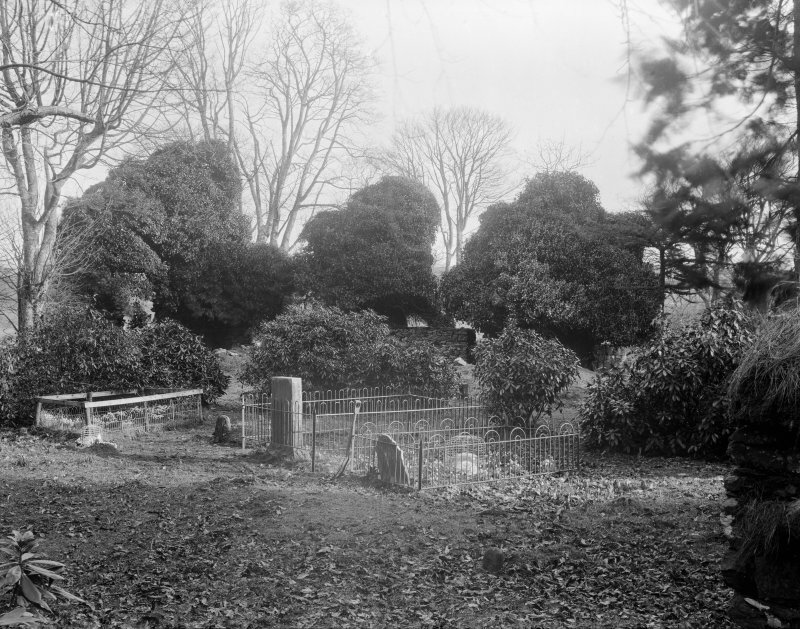 View looking across graveyard to presbytery. View of sculptured stones, Saddell Abbey graveyard. 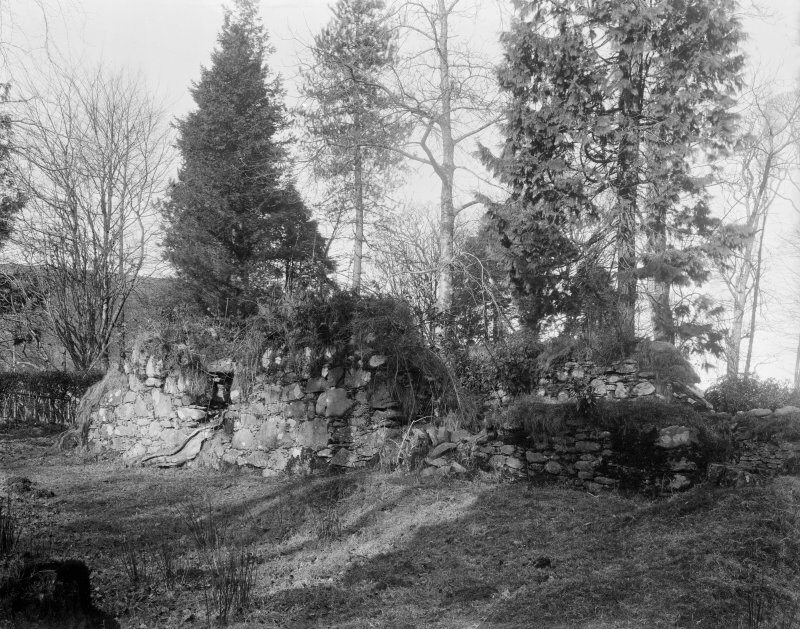 The fragmentary remains of the Cistercian Saddell Abbey, dedicated to the Virgin Mary (McKerral 1954) lie on a slightly raised promontory immediately above the confluence of Saddell Water and Allt nam Manach, the proximity of its conventual buildings to the latter suggesting that it was used for drainage purposes. 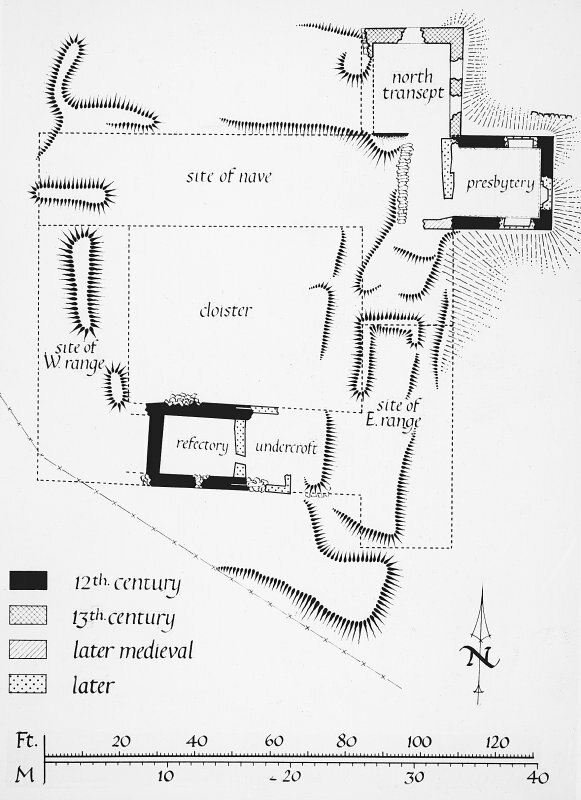 The buildings have consisted of a cruciform church with three main ranges of conventual buildings grouped round a cloister on the south side. Of the church, which consisted of an aisleless nave, chancel and transepts, only the chancel, 4.6m in maximum height, and the north transept remain upstanding. A low, 19th century wall separates the chancel from the crossing. Part of the centre of the south claustral range, possibly the undercroft of the refectory, also survives, probably because it was used as a post-Reformation burial place. The other buildings are represented by turf-grown mounds of debris. 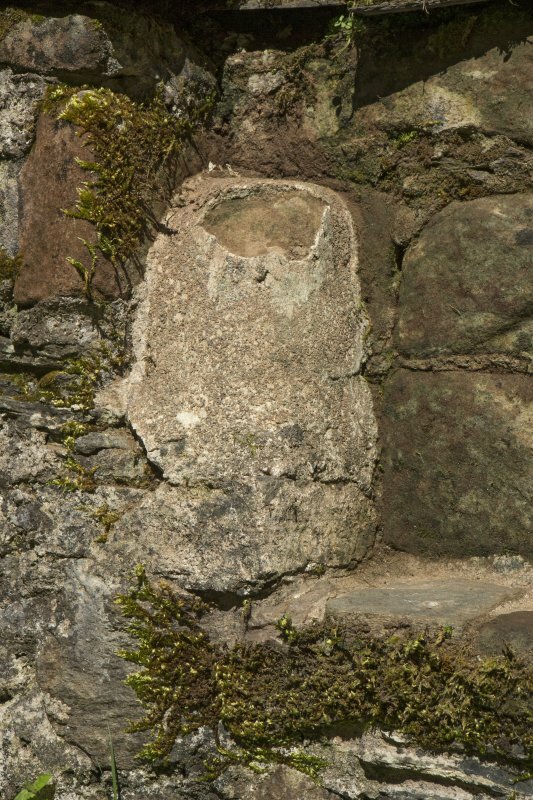 All the exposed masonry is of random rubble laid in lime mortar. The abbey was founded about 1160 and, apart from the north transept which is probably a 13th century rebuild, the existing lay-out and buildings belong to this period although the chancel shows some evidence of fairly recent reconstruction. By the second half of the 15th century the abbey had been abandoned by its community, and about 1507 the lands were erected into a free barony. 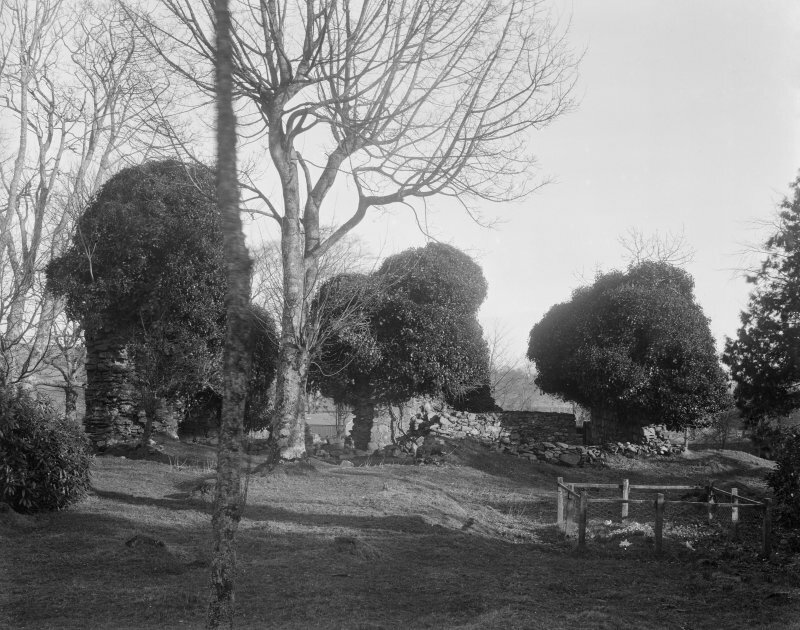 Considerable remains of the buildings survived until 1770 when they were heavily robbed for building on the Saddell Castle estate. 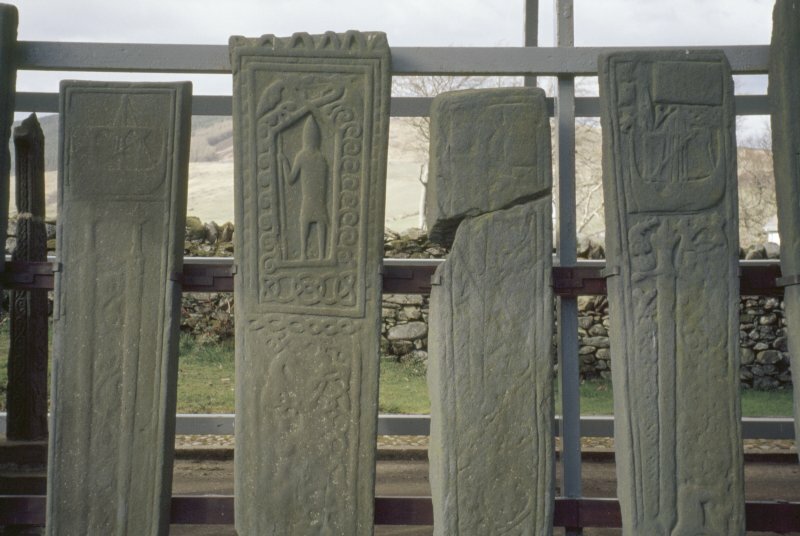 Twelve 14th to early 16th century burial slabs are preserved in the chancel, while others are in the burial ground and a group of late 17th century recumbent stones is situated just outside the south and east walls of the chancel. 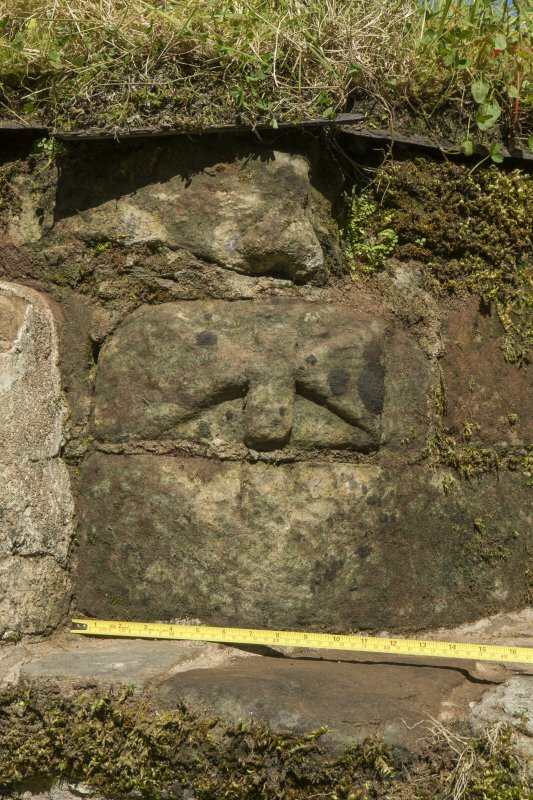 Architectural fragments are in Campbeltown Museum. 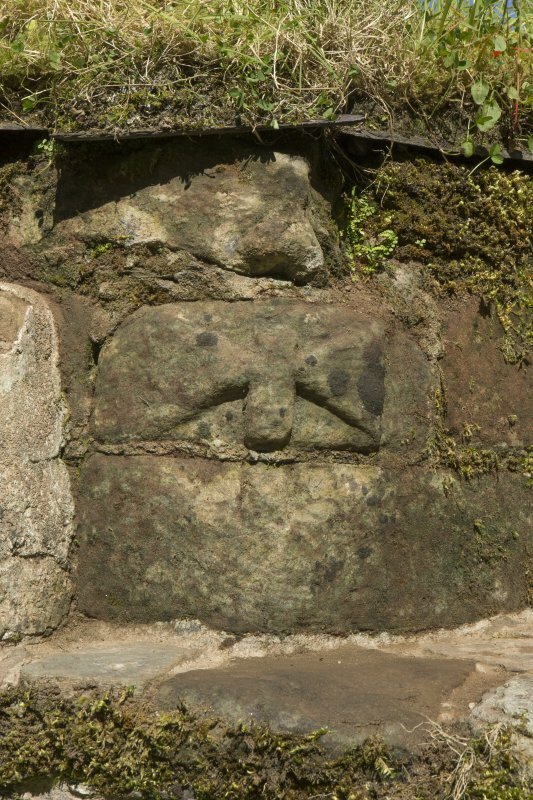 The holy well is a spring into whose mouth a stone drinking basin decorated with a Latin cross has been inserted. This is of early 19th century date but is said to replace an earlier one of similar type. 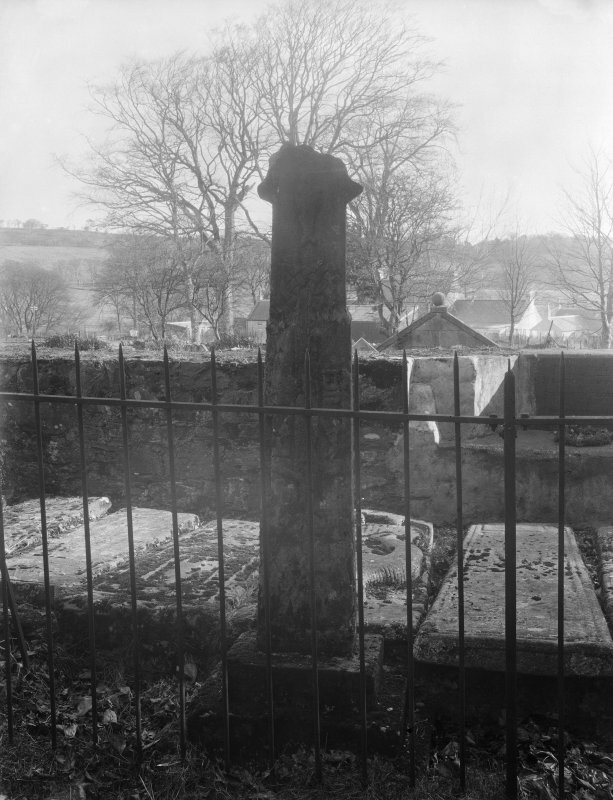 A McKerral 1954; RCAHMS 1971. 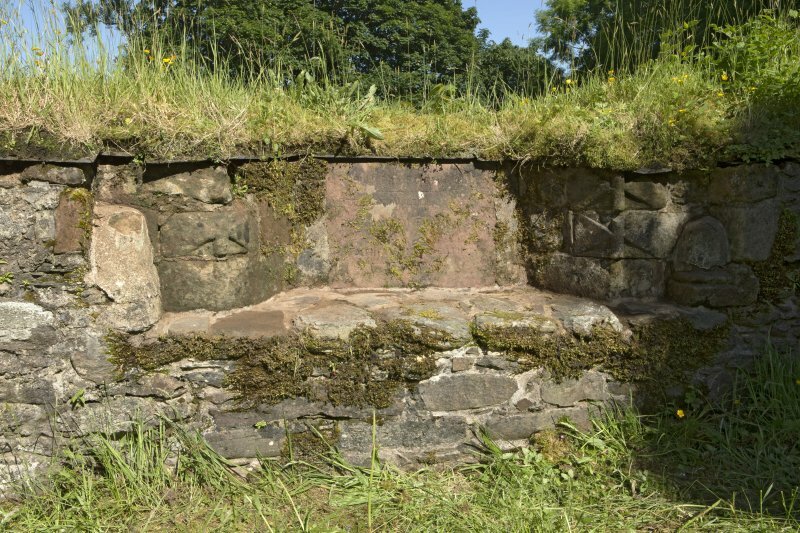 The remains of Saddell Abbey and the holy well are generally as described and planned by the previous authorities. Shallow trenching along the east range suggests the foundations here have been totally removed. 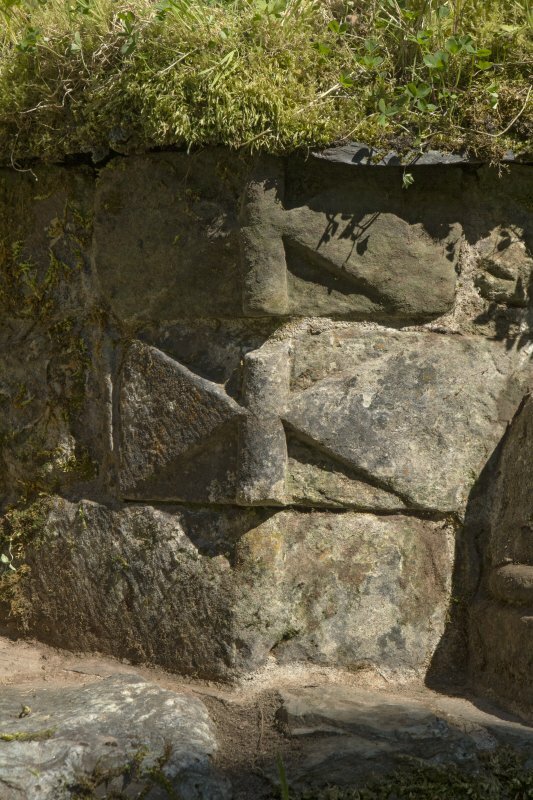 If this trenching represents the line of the wall, the east range has not been at right angles to the church, but inclined slightly to the west. 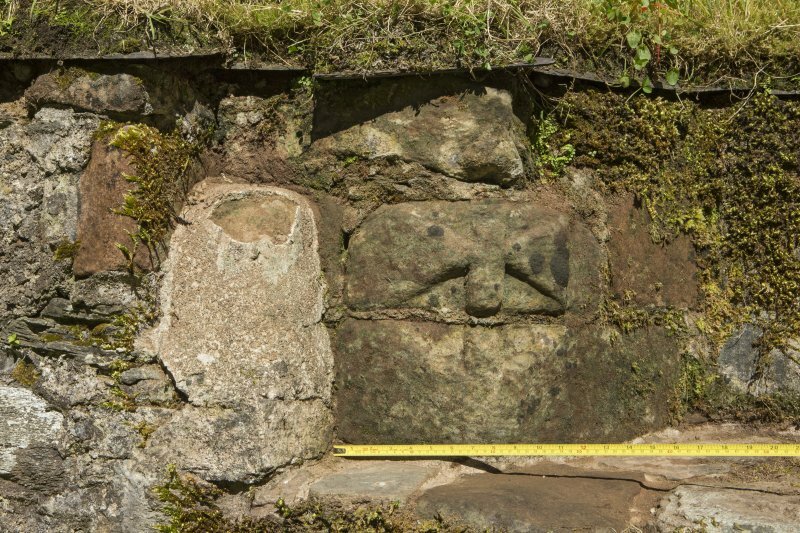 The twelve 14th to early 16th century burial slabs have been removed to the NE corner of the burial ground at NR 7852 3208 and are now set up under a protective roof. Visited by OS (JB) 25 February 1978. 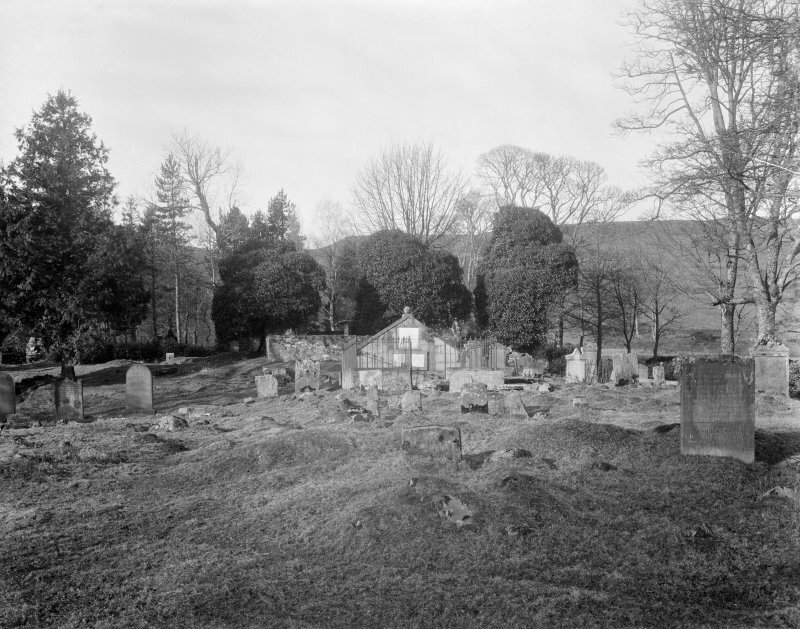 In July 1997 an archaeological survey of Saddell Abbey was conducted by GUARD, comprising a standing building survey of the ruins, and a topographical survey of the graveyard. 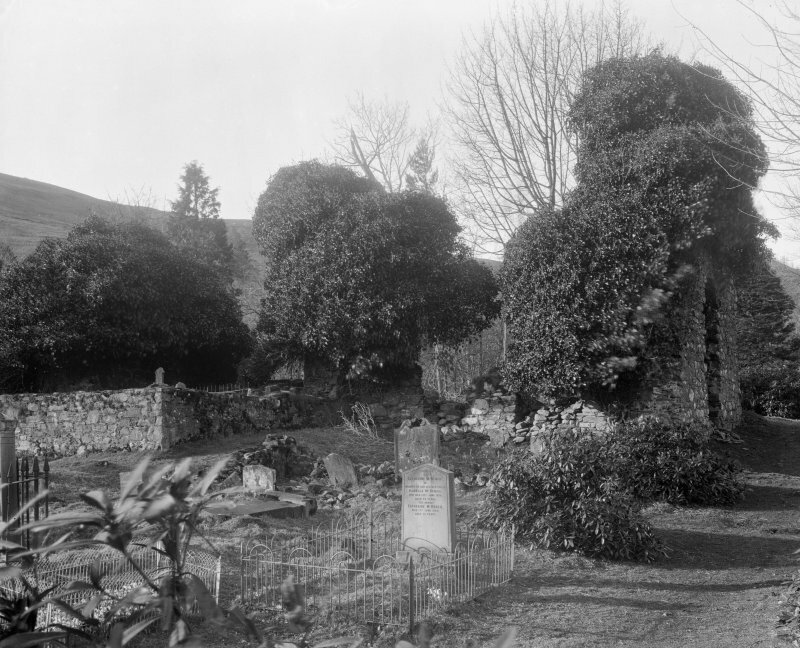 NR 784 320 Surveys were made of the standing ruins and surrounding cemetery at Saddell Abbey, Kintyre (NMRS NR73SE 1). 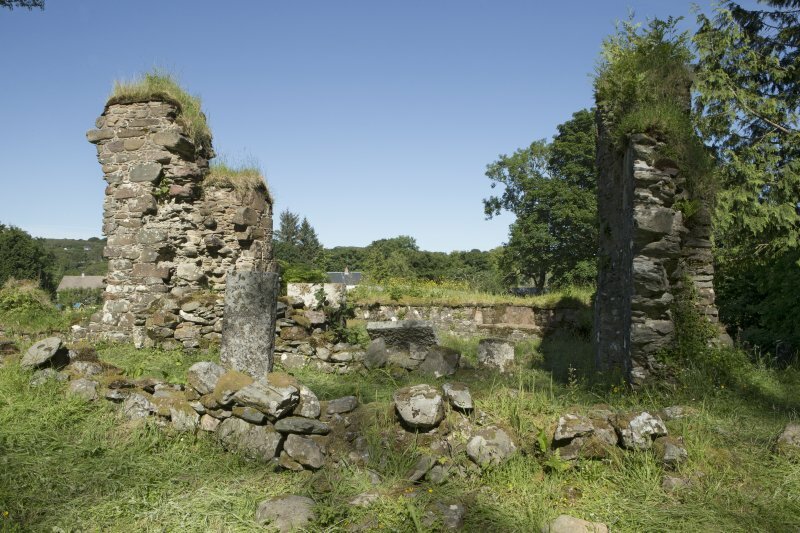 The ruins of this former Cistercian house are slight and were found to be in an extremely unstable condition. 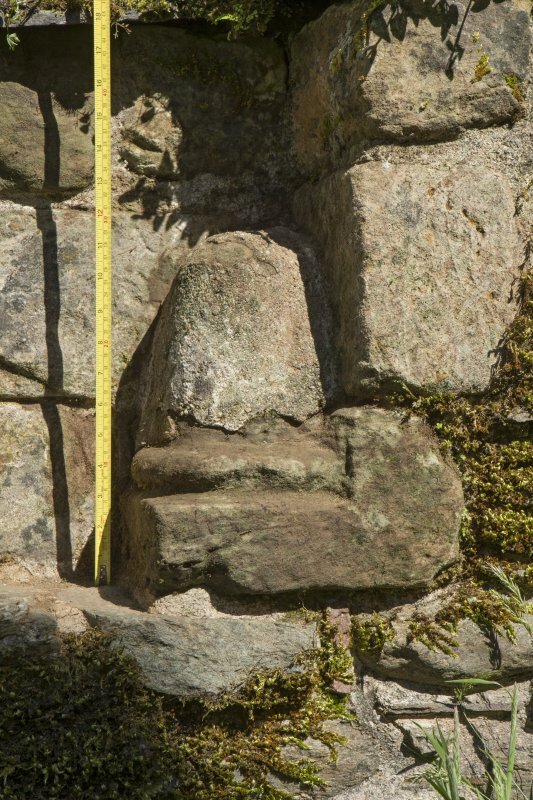 Analysis of survey data deduced that little primary masonry survives amongst the upstanding remains. Sponsor:	Hunter Marshall Bequest (Glasgow University). NR 7846 3207 Two parallel trenches were excavated in November 1999. Several deposits and features of interest were identified, including some evidence of burning, but as the trenches were very narrow it was impossible to gain a clear understanding of their significance. 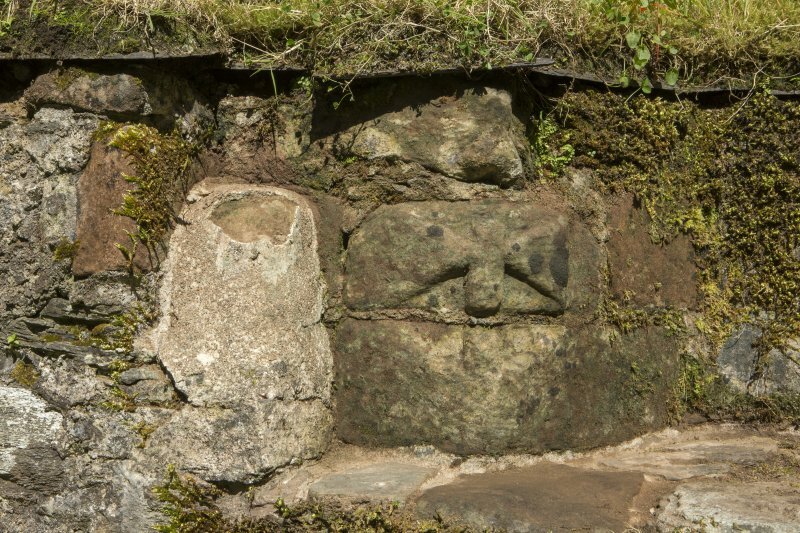 It is possible that these remains are associated with Saddell Abbey. No artefacts were recovered. (GUARD 723). Sponsor:	West of Scotland Water. 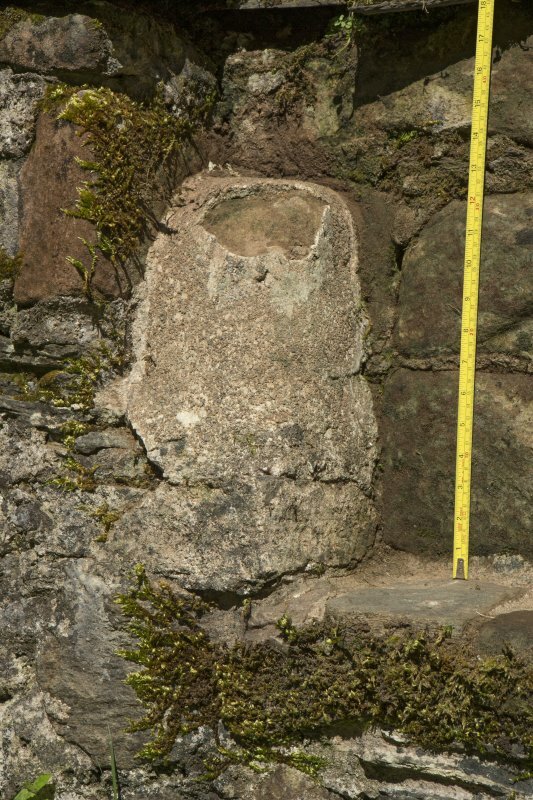 NR 7847 3207 A 14th-century graveslab was discovered in a pile of rubble in the NW corner of the presbytery during conservation works. The stone is blonde sandstone, unlike all the other Saddell medieval gravestones which are schist, and is broken into two pieces measuring 500mm long by 490mm wide and 820mm long and 460mm wide, overall 1.32m long and 0.49m wide and 0.15m thick. There is a relief figure of a warrior wearing an aketan and carrying a spear, shown standing in profile within a niche centrally placed on the stone. 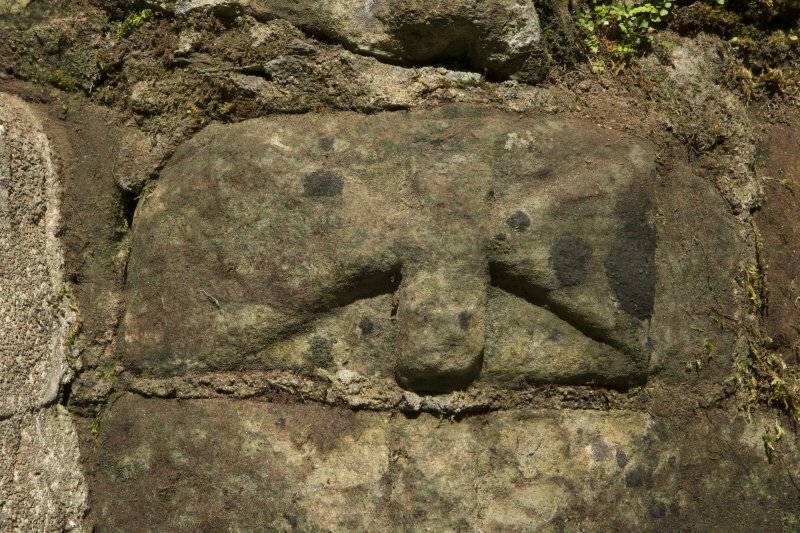 Underneath the warrior figure are the remains of a sword on a stepped base. There are traces of foliate and interlace design on the stone but it is very weathered and details cannot be deciphered. 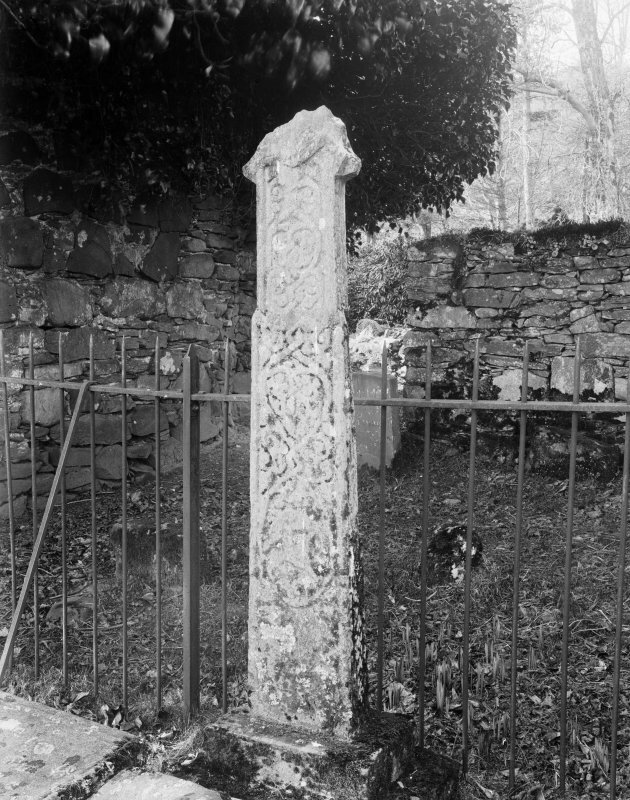 The stone appears to be carved in the Loch Awe style. 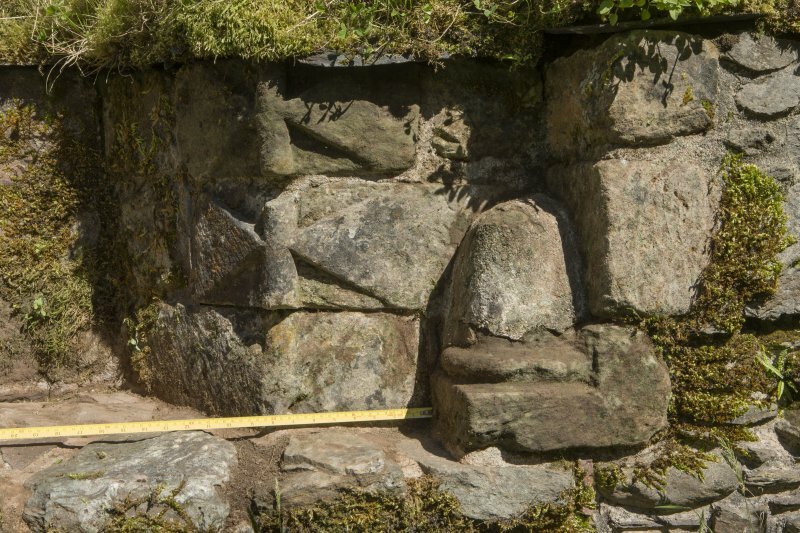 The stone has been conserved and is now in the new on-site display shelter. A watching brief was undertaken of the formation of a new car park area located on the old village green adjacent to the main road and track to the abbey. 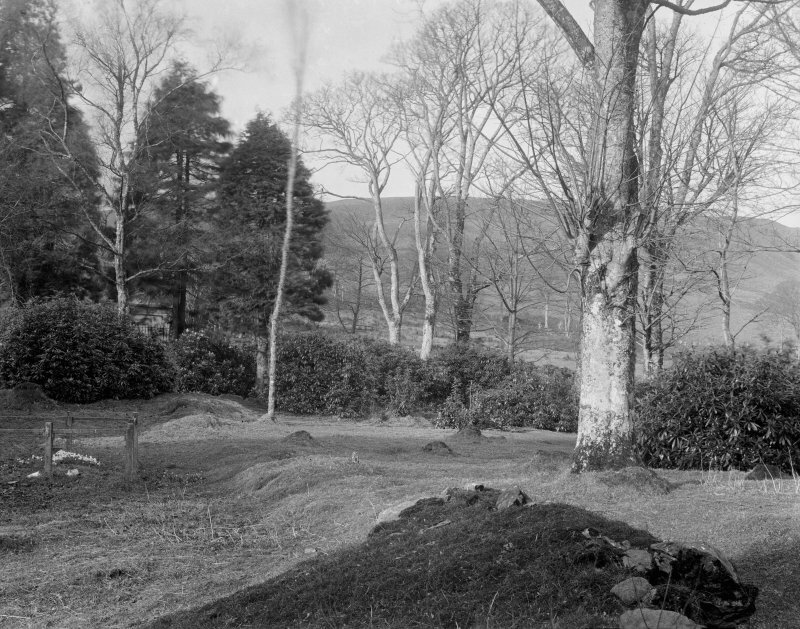 The foundations of the old blacksmith's house of early 19th-century date and two small associated shell middens overlay a layer of stony subsoil; the stone density may be representative of demolition and levelling debris from drystone buildings. A medieval shell midden, 2m in diameter on a rough cobble platform with an associated burnt soil, was uncovered under the stony layer on the natural sands. This midden was primarily composed of periwinkle shells with some limpets and rare bones. The bones indicate the meat and waste parts of sheep and cattle, and a single rabbit bone was present along with a fragment of human pelvis. Some of the bones had been gnawed by dogs. The plant remains indicate black oat, oat and barley and associated weeds, and that alder, hazel and birch were exploited for firewood. A small crucible and a piece of non-ferrous slag were also recovered from this midden. Report to be deposited in WoSAS SMR and the NMRS. Sponsors: HS A, HLF, Argyll and Bute Council. MSS General Hutton Nos 24-27. Vol 11 - rough plan dated 1800 & sketches of monuments. Scheduled Monument 3645. Re-scheduled area27 January 2005.
c.1470. 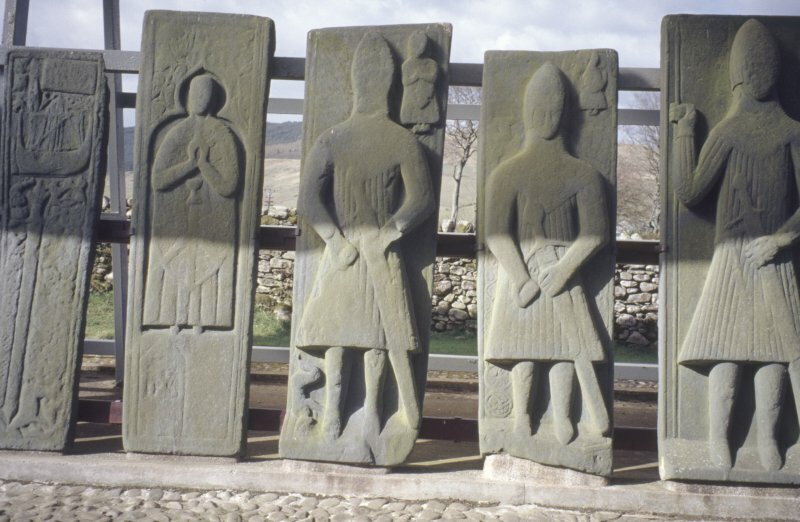 James IV tranferred its lands to Bishopric of Argyll 1507-8.